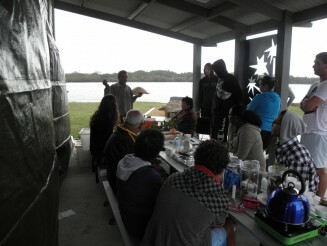 The Queensland Health Gold Coast Health Service District Indigenous Health Service (GCHSD IHS) 2011 Bush Tucker Walk was held at Fingal Heads in November 2011 with 27 people attending from across the Gold and Tweed Coast Aboriginal and Torres Strait Islander Community. Cold and rainy weather on the day kept us to a Bush Tucker talk instead of a walk with local Aboriginal Fingal resident Frank Krasna kindly sharing his traditional stories and wealth of knowledge on local bush tucker such as Bunya Nuts, paperbark and a range of different native trees and their uses with our Group. 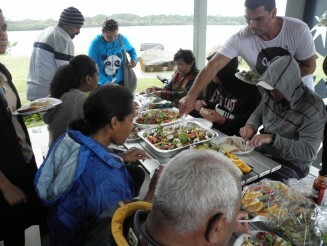 On the day a beautiful lunch was prepared and shared which included some recipes using traditional foods. The lunch included a Rainforest salad made with lilli pillis, macadamia nuts and desert flakes (kutjera or bush tomato flakes), Rosella Flower tea, Aniseed myrtle tea, and a native fruits slice made with rosellas, Davidson plums, lilli pillis, finger limes and Burdekin plums – yummy. The GCHSD IHS Bush Tucker Recipe Cards were also launched on the day. The cards each feature a native ingredient and recipe. The native ingredients featured included Lemon Aspen, Native Thyme, Finger Lime, Kangaroo, Native Ginger and Macadamia Nuts. If you would like to find out more about the recipe cards please contact Sonya Mattiazzi on 075525 5627 or via email on Sonya_mattiazzi@health.qld.gov.au. The group enjoy some bush tucker lunch. Frank shares his wealth of knowledge about bush tucker. The Indigenous Health Service is proud to be supporting the Calendars and Recipe cards and promoting eating more traditional, local foods and using healthy recipes for the health and wellbeing of our local community. Even though it was a little wet & windy it was a great day, thanks Frank for sharing your special knowledge of bush tucker & history of the local area, it’s a great way for my son to learn about his culture. Also thanks to Indigenous Health Service for providing the yummy feed & showing how easy it is to include bush tucker into our meals.